With my husband working across the country (and sometimes outside of it), we move around quite a bit. Our latest move brought us to one of the oldest towns in South Carolina, Camden. For a city girl like myself, I do not enjoy any of the “southern downhome charm” of this town. To me, it looks old and near abandoned. But, in this “hole in the Earth” is by far, my favorite to go to restaurant. Not only is the food absolutely delicious, it’s very moderately priced, HEALTHY (which is amazing for a restaurant) and caters directly to my children, as well as myself. They are very versatile and will change anything printed on the menu to what you want and usually don’t charge a dime more for it. Not only that, the TO-GO food is just as delicious as sitting down to eat, with the same portion sizes, flavor and value. The wait staff is excellent except for the “to-go” girl whom rarely gets a tip from me because she is extremely rude and will look over me to help her “regulars” before myself, even if I am in there first and my food is waiting. But I can’t base the whole of this restaurant on one rude woman. Everyone else is wonderful and overly accommodating! My children love eating here. For dessert, they each get a fresh spun cotton candy on a stick for 99 cents and we’re talking the size of their heads! I have had the Hickory Burger, Seabreeze Spinach Salad, Calabash chicken, Parmesan encrusted Chicken Pasta, Calabash Chicken Wrap, BLT Sandwhich, Grilled Asparagus with Lemon Butter Sauce, Sweet Potato Fries, Cheese Fries, Scratch-made Mac n’ Cheese, Red-skinned Mashed Potatoes, Peanut Butter Pie and the BEST item on the menu, Loaded Baked Potato Soup. I probably get to-go potato soup twice a week for lunch or a light dinner. It’s filling, the flavor is always velvety and smooth as well as being very healthy! 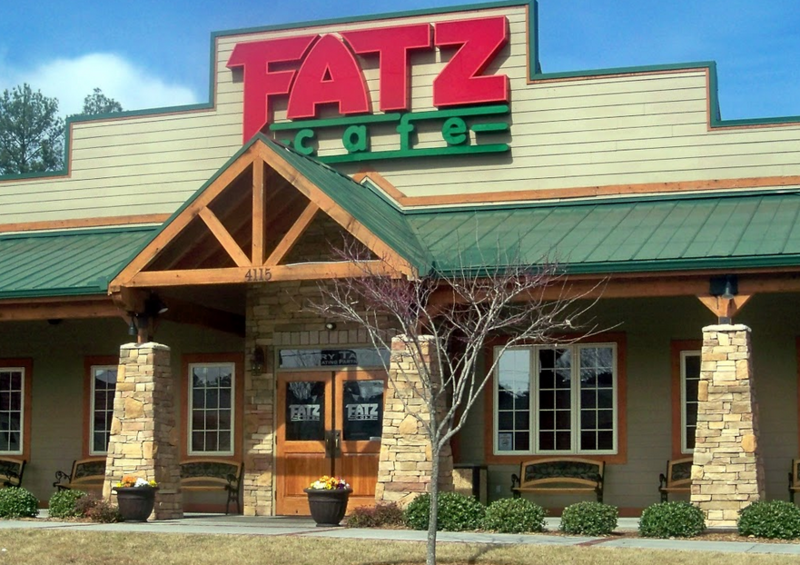 I have not had 1 thing at FATZ Cafe that I did not like. Everything is delicious and I can feed myself and the kids eating IN the restaurant for under $20 including tip! 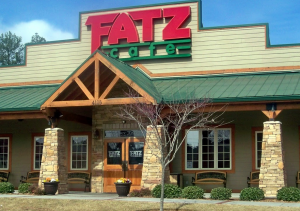 If you’re traveling down the highway in the South and see a FATZ cafe sign, I highly suggest getting off at that exit and having yourself one hell of a meal! On a recent excursion to the East Coast with the kids (14 years old and 6 years old), I happened upon this place by my daughter’s (the 14 year old) request. We had driven 2 hours to get to the coast, had just spent a few hours at North Myrtle Beach in the water and were getting hungry. 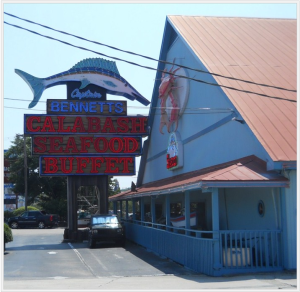 This having been my first trip to Myrtle Beach, SC I had no idea where to eat, though there were many restaurants to choose from. My daughter saw the sign “seafood” and started pointing and screaming. She is a seafood lover just like her mother. My son, at this point, was only interested in ice cream. So, it started the deal. If we walk in and there isn’t ice cream, we walk out. I am not a fan of buffet style food, but my family is so I have eaten at quite a few buffets. I must say, this one topped the list! Like all buffets, the atmosphere was thrown together with gimmicky decor. Most people there were in sweat pants or other very casual attire, talking loudly and eating as much as they could. The wait staff was EXTREMELY friendly, though tipping at 25% for someone to clear my table of a few plates and smile at me (on an $80.00 bill) was a hard pill to swallow. The bathrooms were small and nothing special, but functional and generally clean. It did make us quite comfortable since we weren’t dressed to the nines. We had sand stuck to our legs and feet, sunburns from the beach and frizzy hair from the ocean breezes. We felt quite at home eating in there without having to go get cleaned up first. The menu served much more than just the buffet, though with the price of the buffet, we didn’t adventure outside of that this trip. They had every seafood imaginable available and after seeing the buffet, I was not disappointed. The place was packed at 5:00pm on a Saturday when we decided to eat. Although busy, the buffet tables were always full with freshly cooked seafood (which you could watch the cooks with an open window right over the buffet table) and everything clean and in it’s place, i.e. no cross contamination. I was quite amazed at the variety! They had oysters, clams, crawdads, crab legs, squid, tilapia, seabass, salmon, crab cakes, crab salad, lobster alfredo fried shrimp, baked shrimp, sauteed shrimp and much much more. They also had a full fresh salad bar AND a Southern home cooking table which had ribs, corn bread, collard greens, fried chicken, mashed potatoes with gravy, pork chops, corn on the cob and much to do of the same foods. EVERYTHING was delicious! The kids and I fit in just fine eating as much as we could like everyone else. The hushpuppies were to die for! The price was high, but I can say with certainty that this place had better seafood than any Red Lobster I had eaten at and for the price, I definitely ate my money’s worth and more. I did partake of the dessert table, but the desserts were processed and not very good at all. I didn’t finish mine, instead went back to have a few cold cocktail shrimp with sauce for dessert. My son ate ice cream. And that was it. Lots of ice cream. Which made it hard to pay $20 for a 6 year old to eat 3 bowls of ice cream that equalled maybe $3.00 worth of ice cream from the local store. My daughter on the other hand, ate a little bit of everything, and then a little bit more! Before we were leaving she was begging me to bring her back (and you’ll come to find out she is a picky eater). She will get her wish! Next week, my buffet-loving parents and husband are all going to be in town together and I have decided to take all of them to the coast to eat at Bennett’s. My parents are driving 15 hours from Michigan to us in South Carolina and my husband is flying in from Florida. They are all more than willing to drive 2 hours more to eat at this restaurant based on my reviews. I know they will love it! If you are in the North Myrtle Beach area and have a few dollars to blow, I highly recommend this place. The food is delicious, but don’t expect 5 star accommodations, just 5 star tasting food! Oh it’s fattening, and delicious! My kids prefer it over our local chinese take out! In bowl, add flour, 2 Tbs. corn starch, baking soda, and baking powder. Whisk to incorporate. Add 2 Tbs. soy sauce, wine, 2 Tbs. water, 1 tsp. olive oil and dash sesame oil. Whisk to smooth. 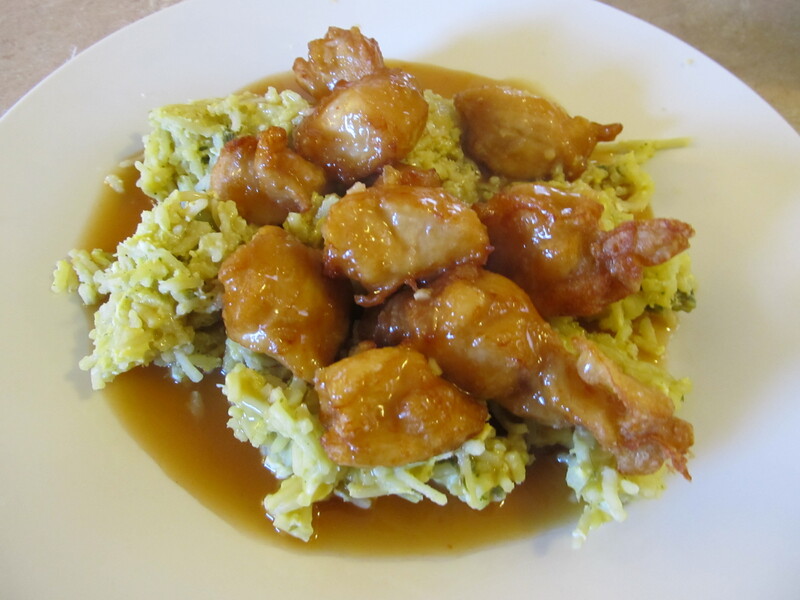 Stir in raw chicken cubes, coating with batter then refrigerate for 20 minutes. Meanwhile, in small sauce pan, add chicken broth, sugar, vinegar, rest of soy sauce, rest of sesame oil, siracha and garlic. Bring to boil over high heat. Dissolve corn starch in water and add to boiling sauce until thickens to desired thickness (I didn’t use all of mine). Reduce heat to low and keep sauce warm so it doesn’t clump. Heat olive 2-4 cups olive oil in sauce pan (or deep fryer to 375) until near smoking. Remove chicken from fridge. Drop battered pieces into oil, a few at a time, careful not to crowd and fry 3-4 minutes or until chicken “rises” to the top of the oil. Remove to paper towel lined plate to rest. Spread rice over 6 dinner plates. Separate chicken into equal portions over rice. Cover all portions in sauce. Sprinkle with sesame seeds and serve immediately (otherwise your chicken will lose it’s crispness and get soggy). Tip: To help counter sogginess of chicken, serve sesame sauce as a side dish to dip chicken into. However, my family eats this so fast it doesn’t have any time to get soggy! 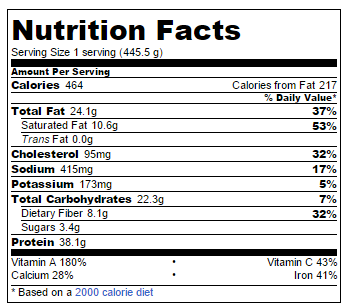 Very healthy and delicious! Lentils are such a versatile bean, they go with practically anything! 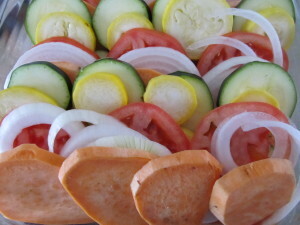 In large frying pan, add tomato, onion, sweet potato, zucchini and garlic pepper. Saute over medium heat about 10 minutes or until all veggies are cooked al dente. 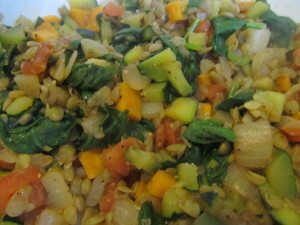 Add lentils and spinach. Cook about 1 minute more until spinach is wilted. Serve. 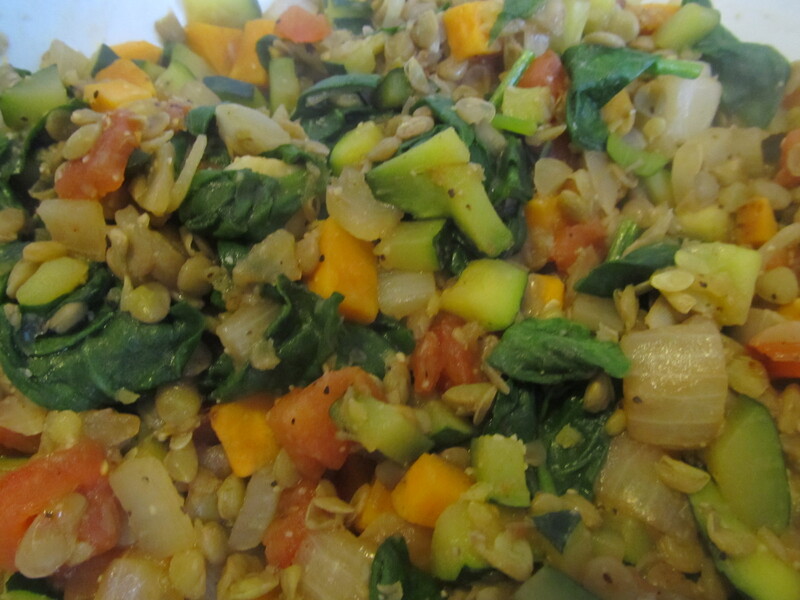 This vegetable dish tastes frighteningly close to homemade lasagna, with TONS fewer calories, fat or cholesterol! Being pregnant, alcohol in my diet is a no no! 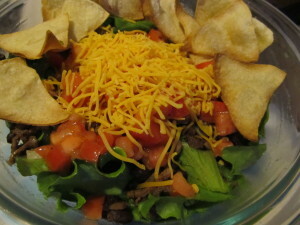 This salad is I feel, more delicious without the tequilla with a powerful lime punch! Add ground beef, garlic, chili powder and chili pepper to frying pan. Cook on med-high heat until meat is thoroughly cooked and crumbled. Add water and turn off heat, letting steam boil over meat while burner is cooling. In bowl, add diced tomato, oil, lime juice, salt and pepper. Stir well until incorporated. Loose chop curly leaf lettuce to bite sized pieces. Separate onto 4 dinner plates. Add meat over lettuce beds. Add tomato mixture over meat. Add cheese over tomatoes. Add beans over cheese. Garnish with baked chips (optional). Enjoy! 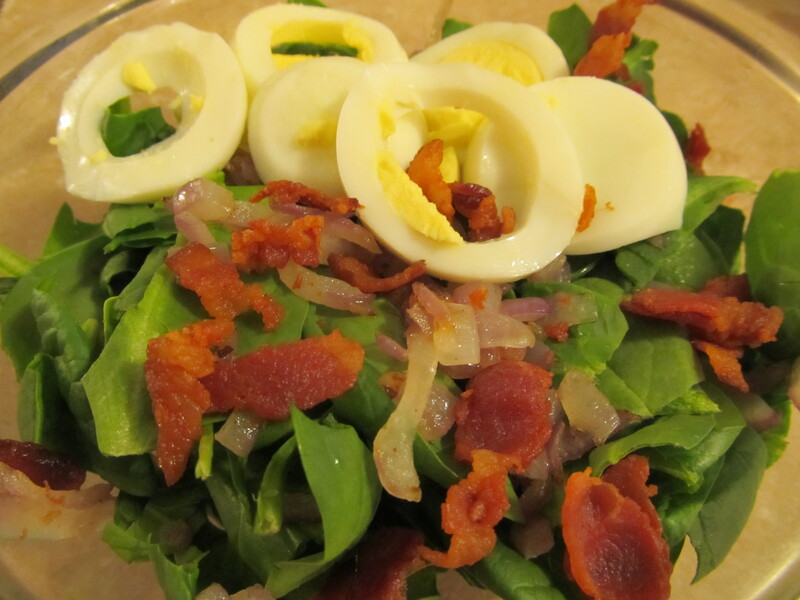 I eat this salad several times a week! It’s a snap if you precook 12 oz. of bacon for the week and crumble it, boil a few eggs and dice a whole red onion, saving all the left overs in the fridge! In non-stick pan over medium heat, add red onion and saute until softened (oil should not be added as the juices in the onion will naturally carmelize the onion), about 5 minutes. Meanwhile, loose chop spinach and add to bowl. Peel, rinse and slice boiled egg, placing in spinach bowl. Add crumbled bacon. Add onions last once cooked and lightly drizzle with dressing. Serve!